There is a good deal of satisfaction that comes from seeing it all come together. In late January, our sixth grade class had the opportunity to visit the gallery and studio of Bryan Haynes in Washington, Missouri. The class made this trip as a part of their integral unit focused on the Great Depression. Mr. Haynes’ work is often rooted in American Regionalism, a style of painting that developed during the 1930s in response to the Great Depression. The work is characterized by such artists as Missouri’s Thomas Hart Benton and Iowa’s Grant Wood (American Gothic). 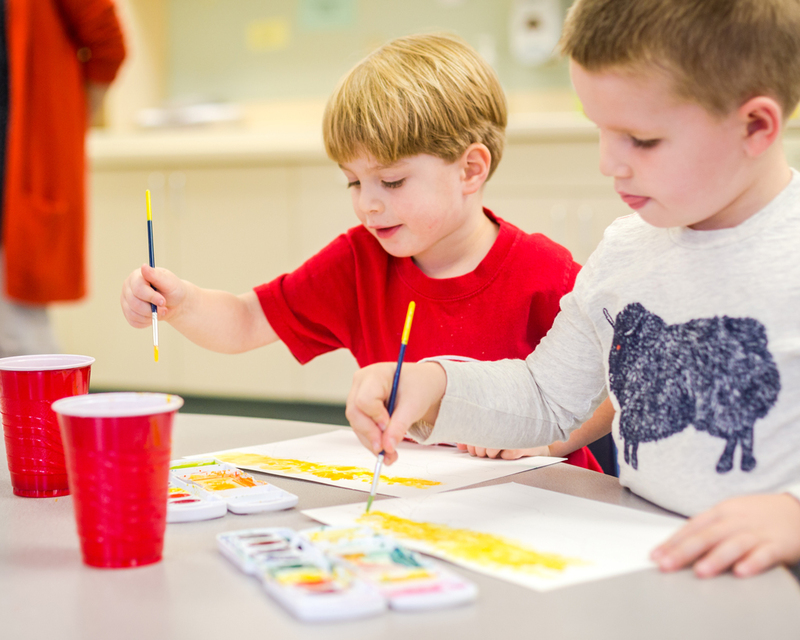 As our students finish their time at Covenant Christian School our desire is that they would have an appreciation for the work of artists across many fields, while also developing their own abilities in these areas. Visiting with and learning from Mr. Haynes allowed our students to go deeper in their understanding of the Great Depression, while adding richness to their own lives. Covenant’s Learning Goals are rooted in our understanding that children are whole persons, created in the image of God and worthy of dignity. As our students interacted with Mr. Haynes that day, and set about their work, I reflected on our goals and how they are playing out in such mighty ways in the lives of these students. Spiritually, our students demonstrated an appreciation for the gifts given to Mr. Haynes by God for His purpose, while also seeking to understand and develop their own gifts. Intellectually, our students asked thoughtful questions, and were able to respond with insight to Mr. Haynes’ questions about the subject matter contained in his paintings. Artistically, our students were given two opportunities. First, they were asked to use their creative gifts to provide ideas regarding a mural that Mr. Haynes is creating for the Missouri History Museum in Forest Park. It was encouraging to watch these sixth graders as they went about their work, as they thought creatively about how to meet the requirements of the project and drew them in their journals. Second, students were asked to use skills they have developed over their time at Covenant to draw a horse sculpture that had been given to Mr. Haynes. The figure was gifted by Abraham Mohler, a sculptor who created the two pelican sculptures on our campus and who has worked regularly with our students. As we were preparing to leave Mr. Haynes’ studio and gallery that day, I thanked him, and he asked me if I thought our students understood how fortunate they were to go to a school like ours. I told him that our students were old enough to recognize and appreciate the opportunities that Covenant provided. As I reflected on this interaction, I was reminded that we are a special community. We have an underlying philosophy of education that arises first and foremost out of our faith in Jesus Christ and which, in turn, emphasizes our need to educate the whole child. It is truly a beautiful thing. And yes, there is a good deal of satisfaction that comes from seeing it all come together. For a short video reflecting on the day our students had with Bryan Haynes, click here. In September, Julie and I traveled to central Iowa and stayed in the farmhouse (now a bed and breakfast) that I lived in from the ages of 10 to 18. I wanted to go back because that place, that farm overlooking the Skunk River valley in central Iowa, has impacted my life in meaningful ways. It was while living there that my faith in Christ blossomed. It was while living there that I developed my deepest friendships. And it was while living there that I learned the true delight that comes with enjoying God’s creation; while also understanding that as a people we can take that good creation and abuse it. Not only did that place impact my life, but it has also impacted the lives of the students at Covenant Christian School. Part of my thinking regarding education evolved from my experiences living on that farm and playing along the Skunk River. A whole child education, which is foundational to our school, means that we help children to experience a depth and richness to their learning and an appreciation for where God has placed them. That farm mattered to me and still continues to matter to me. To this day, I feel connected to that place. I knew the trees and the fields and the critters and the river. It was the best playground a child could ever wish for. It is my desire that our students would feel connected to this place. That it would be special; it would be meaningful to them. I don’t just mean a connection to Covenant Christian School, but a connection to the broader community in which they live. God does not place us randomly. Where God has placed us is important. This understanding is foundational as we provide formal learning experiences for our students connected to place; this place. Encourages students to be active, contributing citizens. In this place we educate and from this place we reach out into our community. We reach out to engage our neighbors, our neighborhoods, the city, this country and this world for Christ. In 2017 Covenant Christian School joined a newly formed association of like-minded Christian schools and educators with a distinctive model, Redemptive Education. The decision to join the Redemptive Education Association of Christian Schools (REACH) was one that evolved over a long period of time. From its beginning in 2003, Covenant has sought, first, to educate our students out of an understanding that children are whole persons, created in the image of God and worthy of dignity. As an image bearer of God, each student is a multi-faceted person. Covenant students are not just intellectual beings, but spiritual, physical, artistic, social and emotional persons as well. It is with this understanding that our teachers work exceptionally hard to plan lessons that engage the whole person as an image bearer of God. Second, Covenant sought to be a school where grace would be found. The school was to be a distinctly different place, where those who care for our students would be in love with Jesus Christ to the point that they are able to demonstrate grace to everyone with whom they have contact. The school is not to be characterized by rules, or strictness, or rigidity. Instead, it is to be characterized by a biblical, foundational grace realized through a personal relationship with Jesus Christ. These fundamental understandings, the desire to educate the whole child in a grace-filled environment to the glory of God, led Covenant to REACH. In the spring of 2007 a group of representatives from Covenant School visited a number of schools in Northern Virginia. We were seeking a model for the whole child, grace-filled education we wanted to provide to our students. A close relationship between Covenant and Lorien Wood began. Out of this relationship and others that Lorien Wood had established, an annual conference was held, which, eventually, led to the founding of REACH. When REACH was formally established in 2017 it simply made sense for Covenant to be a founding member. We are a Redemptive Education school, and it is a blessing to be associated with other schools and individuals who are like-minded. At Covenant, we only succeed to the degree that every student falls more deeply in love with Jesus Christ as a result of being a part of this school. Being a Redemptive Education school, recognizing that children are whole persons created in the image of God and worthy of dignity, helps to provide a solid foundation for this reality. As our sixth grade class walked across the platform Thursday night, the reality of the end of the school year finally hit me. The past few weeks have been a whirlwind, packed with a wide variety of end of the year activities and traditions. But Thursday night meant that Friday morning was coming, and with it our Closing Chapel, the end of our school year. As I look back at the 2017-2018 school year, I can’t help but reflect on what a wonderful year this has been. We have so much for which to be thankful! First, I’m thankful for our students, parents and grandparents. We are truly blessed with a wonderful student body. Our students have a reputation in the community for being grounded spiritually, helpful, academically strong, kind and servant-hearted. That sounds like a great group of students to me! I’m thankful that we can partner with our parents to educate these wonderful children to the glory of God. We are grateful for each of you and your support of the school, both in the classroom and across the community. Second, I’m thankful for our faculty and staff! They are a hardworking, caring, loving, thoughtful group of folks who promote excellence in all that we do. Third, I’m thankful for continued progress in strengthening our school’s ability to educate the whole child. Covenant’s revised mission, “Educating the whole child to the glory of God in a grace-filled environment,” truly came to the forefront this year as we completed the second year of a three year plan to strengthen our school’s academics through an integral curriculum. Exactly! Studies show that when learning is connected to real life and is experiential, students are more engaged in the material and perform better on assessments. I’m personally thankful for a great school year, and excited about the work to be completed this summer as we continue to strengthen Covenant School. I wish for each of you a wonderful, restful summer! Students begin creating full-scale prairie plants. A recent walk down the hallways at Covenant Christian School was a bit startling. 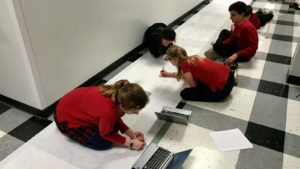 Long rolls of white paper, about three feet wide, had been laid out and students, armed with computers, rulers, drawing pencils and other art supplies, were stationed on and alongside the paper. These rolls, each more than 25 feet in length, were a puzzle. What were these sixth grade students doing and how could it possibly be linked to the school’s curriculum? Observers soon discovered that these lengthy sections of paper were a culminating element to an integral unit. The integral unit was focused on understanding a root cause of one of our nation’s greatest ecological challenges. The students were studying the Dust Bowl of the 1930s and coming to a greater understanding of that event within the context of the Great Depression. The final result included beautiful drawings more than 20 feet in length. An integral approach to curriculum and instruction reflects the cohesive nature of all of God’s creation through thematic units of study organized around important ideas. It minimizes the artificial separation of subjects and, instead, shows the real connections between them. The sixth grade students, working in teams, gathered around the rolls of paper and began to collaborate, measure and sketch. 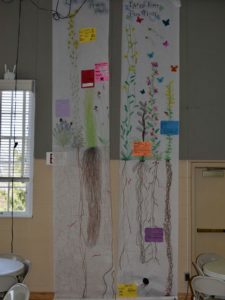 Using photos from the Internet and their research and math skills, the students began creating beautiful full-scale drawings of plants (including root systems) found in their school’s prairie. But why prairie plants? What do they have to do with the Dust Bowl? Over the course of the school year, Covenant’s sixth grade class studies the historical time period 1850 to the present. As they approached the 1930s, students came to understand the conditions leading to the Great Depression, with a special focus on the impact of the Dust Bowl. During their study of the Dust Bowl students learned that vast swaths of the native prairie in the Southern Plains had been plowed under in order to allow for the planting of commercial crops. These crops were not suitable for the land as their short root systems could not hold the soil or maintain moisture during drought. An experiment in the Outdoor Learning Lab helped students gain a greater understanding of the Dust Bowl. To further their understanding, in Covenant School’s Outdoor Learning Lab students conducted an experiment that illustrated the ecological difficulties that come with converting native prairie to commercial cropland. 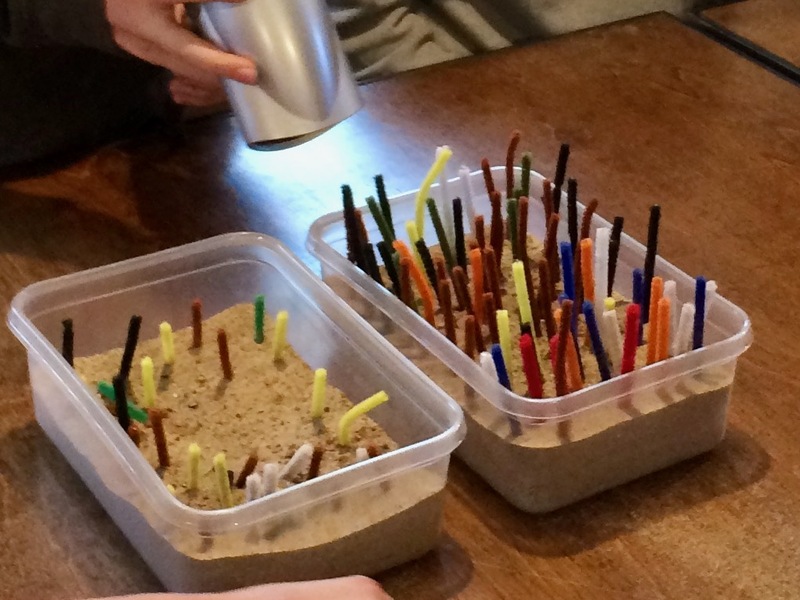 They began by placing sand in two containers. In one they placed pipe cleaners in rows to illustrate short root commercial crops. In the second, they placed longer pipe cleaners close together to illustrate deep rooted prairie plants. They then used a hair dryer and observed the impact of wind on dry soils. In order to provide a depth and richness to student learning, Covenant seeks to provide opportunities to make student learning experiential. When finished, these sixth graders had produced lovely, full-scale drawings of prairie plants found in Covenant School’s prairie. They arrived at this project finale through a process that brought a number of subjects and learning objectives together. Behind these plant drawings is a demonstration of integral curriculum. History, math, science, writing, drawing, art, interpersonal skills, research, and more all came together in a manner consistent with the school’s educational goals. Erica Ballard, sixth grade teacher, and John Roberts, Head of School. 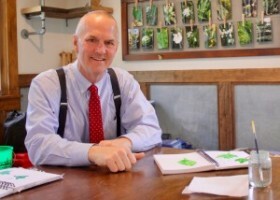 Listen to this blog post as a podcast, read by John Roberts. Yesterday, I spent time around the school observing the work in which our teachers and students were engaged. As I reflected on the day, I was moved to want to share with the school community what I observed. It was another one of those days when I looked around and was especially proud to be a Pelican! In so many ways, I saw our students engaged in creative learning that provided a depth and richness to their studies. Our day began at Morning Gathering, where first and fifth grade students described their joint field trip to the Lewis and Clark Boat House and Nature Center in St. Charles. Purposeful, cross- grade relationships are important to us. This was another example of classrooms working together. In addition, the third grade class shared their excitement about creating and then installing new signage for our school prairie. During recess, our students were gathered around the fire pit where our Outdoor Classroom Director, Katie Mohler, had a fire going. A fire is a great way to engage students of all ages, while also keeping them warm! Our Kindergartners were enjoying their “Wacky Wednesday,” based on the Dr. Seuss book of the same name. 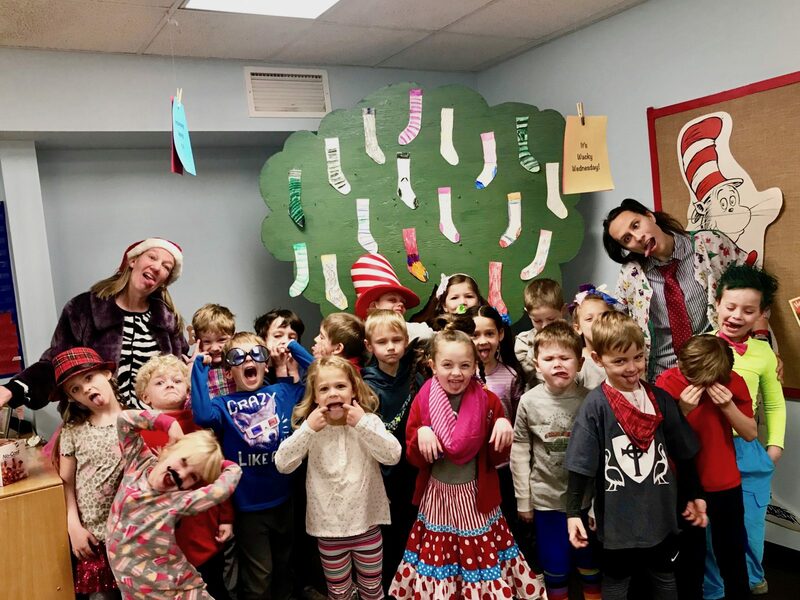 They used their creativity to dress in a wacky manner and were discovering all thewacky things in their classroom, from a shoe on the ceiling to words spelled in reverse order! 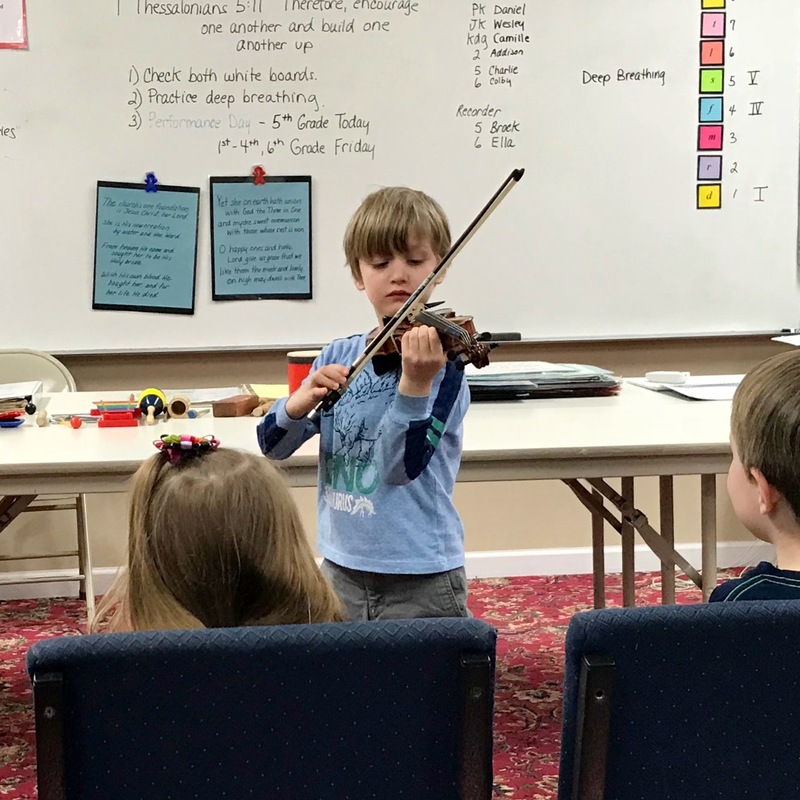 In Mrs. Fields’ music class, Junior Kindergarten student, Calder was sharing his violin playing skills with his classmates. Well done, Calder! In the afternoon, the sixth graders, as a part of their study of the roaring ’20s, were learning the Charleston with Miss Ballard, who was dressed to the nines in her flapper costume. 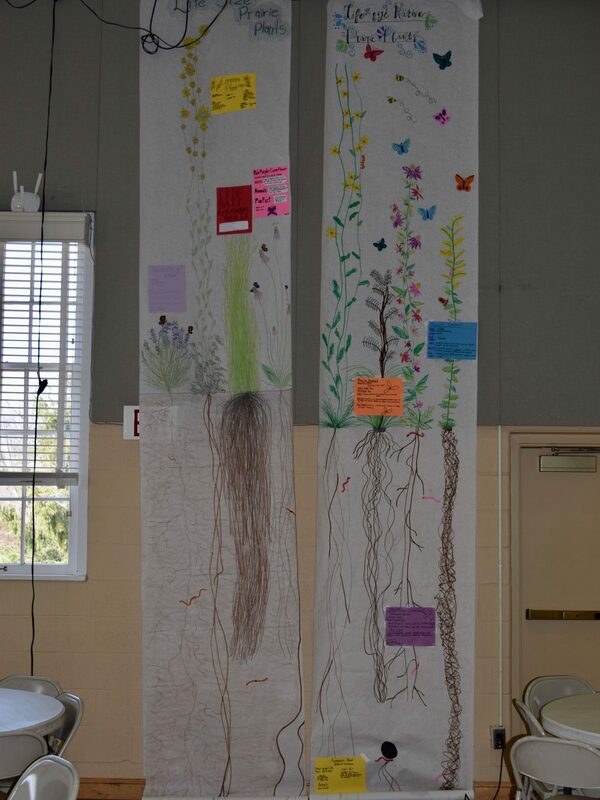 Later, the sixth grade students were in the hallways with long rolls of white paper, drawing, at full scale, the plants found in our school prairie, roots and all! This project demonstrates our integral curriculum as literature, math, science, writing, drawing, art, interpersonal skills, research, and more all come together. Toward the end of the day, I watched as our fourth grade students demonstrated their considerable acting skills as they auditioned for their roles in the class’s upcoming production of William Shakespeare’s, “A Midsummer Night’s Dream.” They perform this play as a part of an integral unit focused on human cultural creation in which students study the works of Shakespeare. It’s exciting for me, as Head of School, to see integral, experiential learning taking place all around me. It was quite a day. It was another great day to be a Pelican! Over the past couple of years Covenant Christian School has been re-examining its foundation. Our school board has updated the school’s mission and vision statements and has identified four areas that are distinctive to how we educate the children in our care. How do we go about implementing our mission and vision? We do so through our school’s distinctives, a Biblical worldview, a Relational focus, an Integral curriculum and Experiential education (BRIE). Biblical – Covenant students analyze all things through the lens of Scripture. They seek to understand what matches up with God’s truth, and what does not. They learn discernment by navigating difficult issues and ideas, without fear, as they prepare to speak into and impact the world for Christ. Relational – Covenant’s purposefully small size allows for deep relationships across the community. Opportunities for intentional teacher-student and cross-grade relationships, as well as parent involvement, are carefully fostered. Integral Curriculum – Covenant’s curriculum has been purposefully designed to provide students with an understanding of the connected nature of all of God’s creation. Too often subjects are placed into “silos,” as if, for example, literature, history and the arts exist without naturally being connected to one another. An integral curriculum reflects our desire to educate the whole child. We think of children as more than just intellectual beings. As persons created in the image of God our students are recognized as spiritual beings, whose needs are to be met not just intellectually, but artistically, physically, socially and emotionally. Experiential – Understanding the connected nature of God’s creation, Covenant uses both conventional classroom teaching and experiences that bring a depth and richness to student learning. These experiences can take place in the classroom, in the school’s outdoor classroom or off-campus. Experiences provide students with the opportunity to confidently explore their gifts and all of God’s creation in meaningful and creative ways. It is on our mission, vision and distinctives upon which all we do stands. Covenant Christian School’s mission is “Educating the whole child to the glory of God in a grace-filled environment.” From its beginning, Covenant has sought to be a community not only characterized by grace, but clearly filled with grace. We want every teacher, every administrator, every helper, and every board member to be in love with Jesus Christ to the point… that everyone who walks our halls will know this is a different place. We will not be characterized by rules, or strictness, or rigidity. We will be characterized by the grace of God realized through a personal relationship with Jesus Christ, which is compassionate toward those who are but dust. These notes are meant to help define what attributes are found in a grace-filled school and how we, as a community, can apply these qualities in our school. I have learned over the years that the application of grace is challenging. Thoughtfully applying grace in the context of relationship takes prayerful, caring effort. …an unconditional release from the judgment we deserve, and accompanying undeserved blessing based on God’s mercy alone. I therefore… urge you to walk in a manner worthy of the calling to which you have been called, with all humility and gentleness, with patience, bearing with one another in love, eager to maintain the unity of the Spirit in the bond of peace. An atmosphere characterized by patience, humility, forgiveness and Christ-like love is at the core of our understanding and application of grace. At Covenant, grace-filled discipline begins with relationship and the application of grace; as we seek “obedience motivated by a heart captured by grace,” we must demonstrate patience, humility, forgiveness and Christ-like love. In doing so, we treat children as whole persons, created in the image of God and worthy of inherent dignity. Modeling grace is critical to developing a grace-filled atmosphere in the school. This is the responsibility of the entire school community. As recipients of grace we must acknowledge the grace that God has demonstrated in our lives and also be generous dispensers of grace. Earlier this school year, Covenant’s third grade students, under the leadership of their teacher, Anne Woodard, experienced the world of the hunter/gatherer. Through this experience, students came to a deeper understanding of what life was like for humans who hunted and foraged to sustain themselves. Their hunter/gatherer experience arose out of the third grade history curriculum and began in the school’s prairie. In the school’s tallgrass prairie, Mrs. Woodard and Katie Mohler, Covenant’s Outdoor Classroom Director, helped students to connect to the hunter/gatherer by teaching them how hunter/gathers navigated by the sun and the stars. Students were fascinated to not only learn about navigation, but they also learned that when there was no wood for a fire, hunter/gatherers would collect dried animal dung and burn it. Their experience continued in the school’s woodlands, where students took found materials (stuff just laying around) and worked collaboratively to build shelters. At Covenant, students go beyond simply reading their textbooks and taking a test. Instead, they are provided with carefully chosen and integrally designed opportunities that bring a depth and richness to student learning. This depth and richness comes through experiences that demonstrate the connected nature of God’s creation and allow students to confidently explore their gifts and all of God’s creation in meaningful and creative ways. In this case, students took this experiential opportunity in directions that the teacher did not anticipate, moving themselves from hunter/gatherers to barterers to developing businesses to support the village they were creating in the woodlands. Well-designed experiences reflect the interests of the students, allow them to learn to work collaboratively and let them take the lesson to the depth that they desire. Back in the classroom, students had the opportunity to share about their learning. In doing so, the children were asking questions of one another and thinking reflectively and critically about what they had accomplished. While they shared, students continued to make connections. For example, they speculated as to why people in ancient times might barter for goods rather than have a monetary system. Continuing their work, students drew maps of the village they had created in the woodlands and produced drawings of their group’s shelter. After sharing everything they had learned, the children then wrote about their experience, in letter format, as a means of communicating what they had learned with their parents. 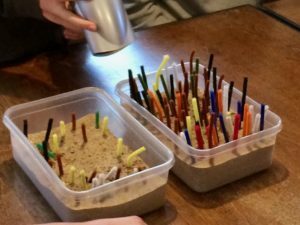 This post provides just one example of experiential learning, but experiential learning grounded in an integral curriculum is found throughout the school. 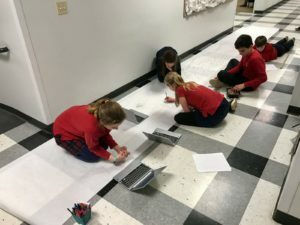 This one experiential opportunity connected to the third grade history, science, math, writing and drawing curriculums, while also engaging the whole child spiritually, intellectually, socially, artistically, emotionally and physically. 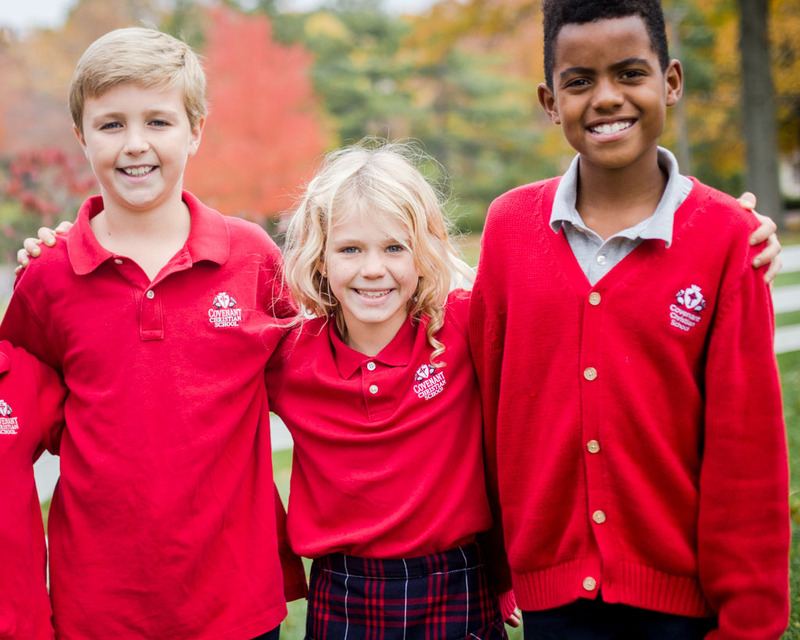 Since its founding in 2003, Covenant Christian School has sought to educate the whole child. Our call to educate the whole child arises from an understanding that each child is created in the image of God and is multi-faceted and worthy of inherent dignity. Our teachers work exceptionally hard to plan lessons that engage the whole child as an image bearer of God. This understanding is deeply rooted in our school and reflected in everything we do. Covenant School educates the whole child by coming alongside each learner to help them grow spiritually, intellectually, artistically, socially, emotionally and physically. Educating the whole child, recognizing their inherent dignity, naturally enables us to provide a richness and depth to student learning. We think of children, first and foremost, as spiritual beings. When they finish their time at Covenant, we want them to love the Lord and their neighbor, have a foundational understanding of Scripture, know the gospel and to be able to defend their faith. Intellectually, we seek to have our students ready to find academic success wherever God calls them after they finish their time at Covenant. We help our students to be self-motivated learners, and purposeful, creative, and innovative thinkers. Each student’s artistic gifts are developed through the fine and performing arts. For example, students take art class, but to further hone their skills they also take a separate drawing class. In addition, our students have multiple opportunities to perform on stage in a variety of settings. We carefully nurture our students socially and emotionally, helping them to apply biblical principles to relationships. We help them identify and use their personal strengths, take responsibility for themselves, demonstrate respect for peers and those in authority and work effectively both individually and in group settings. 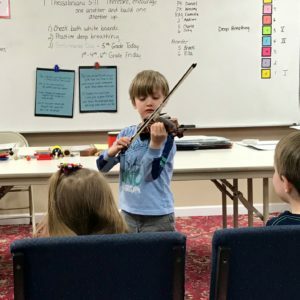 Carefully chosen experiences that blur the lines between the traditional classroom and the learning environment provide deeper understanding, while enriching the learning experience and demonstrating the connected nature of God’s creation. These experiences allow students to confidently explore their gifts, and all of God’s creation in meaningful and creative ways. Covenant intentionally allows for children to be active. 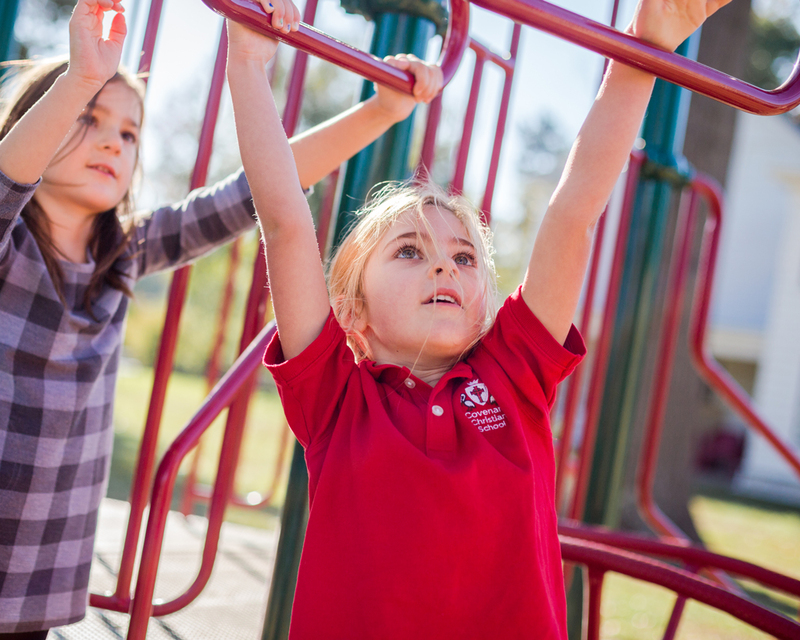 Recess is an opportunity for our students to play more traditional games, but also a time for fort building, tree climbing and engaging creatively with the school’s extensive and varied outdoor space. At the same time, Covenant students, through the Physical Education program, develop new skills as they learn to participate with Christ-like character. Thinking of children as whole persons is at the core of our school. It is reflected in everything we do: from our biblical worldview, to our integral curriculum, to purposeful relationships, and the experiences provided for our students.